Ladies in sleeveless floral dresses and men in linen suits mingle while sipping cocktails in summer’s golden hour. for the grand entrance of the newlyweds. A whistle and cheer erupts from the front entrance of the winery as the bride and groom come into view. As the sun dips below the horizon, the letters A & L appear across the lawn and the happy couple steps into their special spotlight. 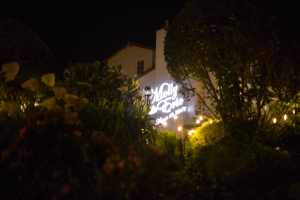 Friends and family clap and cheer and, like magic, a blanket of stars lights the olive grove where dinner and dancing will soon take place. The guests take their seats at tables awash in a rosy glow near a dancefloor lit with purple swirls. Everyone hopes to create a magical scene like this one for their special day, but adding a personalized touch to an outdoor wedding can feel daunting, especially at a large venue. Where should you even begin? 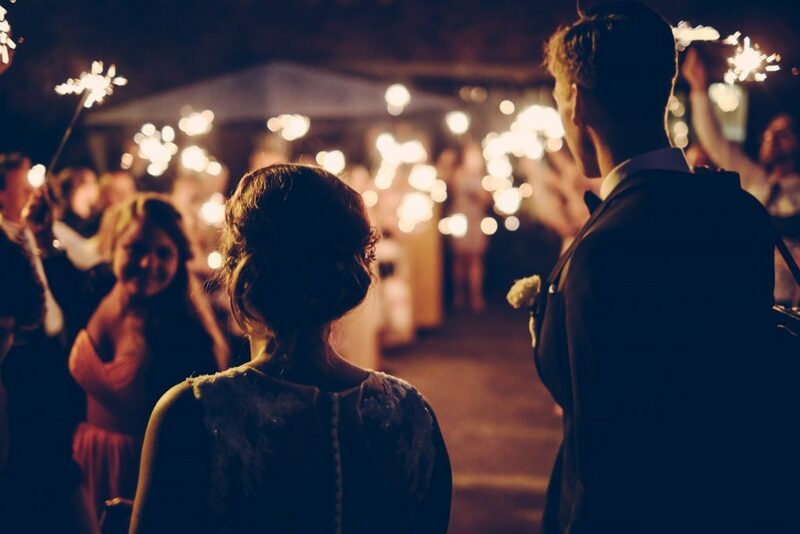 People often assume that outdoor weddings must rely only on string lights or lanterns but gobo projection is the key to achieving your own unique lighting design. With the right timing and projectors, you can incorporate custom gobo images into an all outdoor affair. Whether it’s a wedding monogram projected on the dancefloor or a starry night pattern thrown across the dinner tables and the bar, gobo projection quickly makes a public space feel like your own. Once you’ve chosen your gobo and the projection surface, the final key to achieving a magical ceremony and reception comes down to timing and the right projector. GoboSource projectors can outshine the last rays of light at sunset with high-power LED lamps that project with maximum output while still conserving energy. 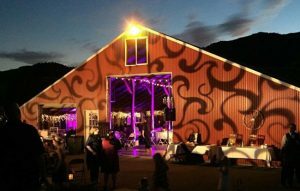 Once the bright, direct rays of sunlight are softened to the warm pinks, oranges, and reds of dusk, a gobo projection can illuminate an outdoor surface like a walkway or the facade of a barn. Use a custom gobo with your favorite quote or a whimsical pattern to ‘paint’ the outside wall of the wedding venue. If the surface falls into shadow during ‘golden hour’—that magical time just before sunset—the projection will be visible even before the sun sinks below the horizon. Get the look: The giant swirls across the barn in the photo above were achieved with our Dream Grill stock gobo and the ECO Spot B90 Projector. When the sun has fully sunk below the horizon your gobo projection will grow bolder and brighter. Take advantage of the failing light to illuminate a beautiful architectural feature with the names of the newlyweds and the date of the wedding. This creates a memorable backdrop for photos of the bride and groom and the wedding guests. This is also the perfect time of night to light up the dancefloor. Get the look: To recreate the flowing font of the first photo, order a custom glass wedding monogram gobo using Edwardian Script and the ECO Spot C40E Projector. For the lovebirds, get the look with a custom monogram dove gobo and the ECO Spot C25 Projector. For our full catalog of available wedding monograms, visit our Wedding Gobos page or submit your own custom design. Posted on April 24, 2018 by gobosour. 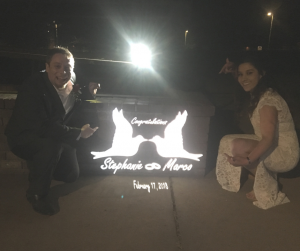 This entry was posted in Wedding and tagged custom gobo, custom gobos, ECO Spot projectors, event decorating, gobo, gobo projector, lighting effects, monogram gobos, outdoor projection, outdoor wedding lighting, wedding decor, wedding monogram. Bookmark the permalink.